Expectation has a lot to do with perception. How often have you expected something great–either because you heard great things or because you were just excited about it–only to be let down by the experience? The nice thing, though, is that the expectation dichotomy applies just as equally to under-estimated experiences. 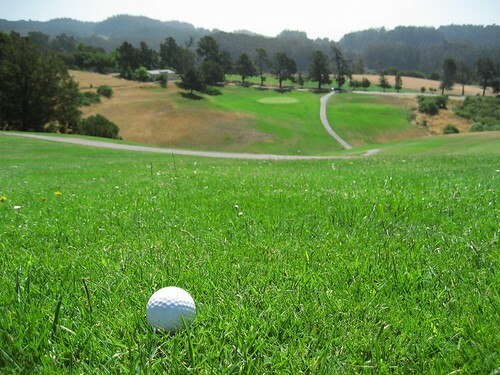 With that in mind, one of the most overperforming golf courses I’ve ever played is a dinky little public course called Lake Chabot (in Oakland/Berkeley, CA). I got out there on a Saturday. The first thing I noticed is that the driveway actually runs through the course (the front 9). When you’re playing, you have to make sure no cars are coming–and, when you’re driving in, you have to stop between each hole to make sure no golf balls are flying into your window! Kind of wierd. The second thing I noticed was how hilly it was. I knew this was going to be a walk. Other than that, I didn’t expect much. I randomely paired up with some people, paid $25, grabbed my bag, and started out. At $25, the main reason I went to the course was the price. Nowhere else in the entire bay is a green fee so inexpensive. The course had a lot of short par 4s, which I found to be a lot of fun (trying to hit in 1). At around 68.5, it’s not the hardest rated course. The par 5s weren’t long, but most of the holes had small greens to make up for the shortness. The crazy elevation changes were obvious–a whole lot of ups and downs. I didn’t realize how much elevation changes were present, but they became apparent on the 9th hole. The 9th is actually a 190 or 200 yard par 3, but it’s so far downhill that you can’t see the green from the back tees–you actually have to walk up about 30 yards to even see where to hit! I got a 9-iron onto the front from there! For a guy who likes a little elevation change, this is a nice thing. Also, since I had been playing Palo Alto Municipal, I had been a little starved for some hills. At the end of the 11th hole, there’s a turn stand where a very sweet black woman personally grilled a hamburger for me. You place your order, at the end of 11, walk to the 12th tee, tee off, and then walk back past the stand and pick up your food. Did I mention it was grilled–on an outdoor charcoal grill!!!! Unbelievable. I’ve never seen this at another course, but it makes me wonder why no one else does this when it’s SO GOOD! Now, walking this course required a lot of trekking up hills. The first 5 or so holes were up and down constantly. The 6th, 7th, and 8th were all uphill. The 9th, as previously stated, lost a lot of altitude. But starting after the way downhill 9th, the 10th was uphill. The 11th was uphill. The 12th was uphill. The 13th was uphill. The 14th was uphill. The funny thing is, even though I was going uphill for all of these holes, I didn’t really think much about it, except that it was just a bunch of uphill holes. Then, I hit the 15th. At first, it didn’t look like much–another short par 4. I thought “finally, a flat hole.” I teed off, put my ball in a nice spot, picked up my tee, and start walking. Then, as as I was walking about 100 yards in front of the tee–where I’ve finally hit a good flat spot in the fairway–I looked to my right and saw one of the most breathtaking views you’ll ever find: in the foreground, Oakland city bordering the SF Bay. I saw the Bay Bridge leading into SF. The sun was still up, glaring down into the bay. The fog was rolling in over the hills. I saw the Golden Gate in the background, leading into Marin county. Never in my life have I wanted so much to sit on one golf hole and just wait for hours, enjoying the view as the rest of the players just passed me by. This feeling, I will never forget. The picture doesn’t do it justice…..
And then, 18. A 715-yard par 6 (that’s right–SIX). It is flat for 260 yards, and then STRAIGHT downhill. The cart path actually crosses back and forth across the fairway, as if descending Mount Everest. When at the bottom, the last 100 or so yards are back up a hill to the most undulating green on the entire course. I’ve never experienced a place quite like Lake Chabot. I know it’s not the greatest course, it’s not in the best shape, it probably gets a lot of play and gets backed up, but the 15th alone is worth the price of admission, and the rest is just more and more icing on the cake. After playing a good number of golf courses, I’ve never felt so much like a course rewarded me for playing it as Lake Chabot did. The buildup of 15 holes of reasonably fun golf to have the rewards of the last 4 were totally worth it. I would go back in a heart beat. Now, for the bad stuff. I played this course a few times over the summer, and, it was never in truly good shape. The fairways were either little baked out or not cut (see the photo above–those long blades of grass are in the fairway! ), and the greens were a little long (which really stinks with Poa–lumpy and bouncy). The course isn’t much of a challenge, unless elevation changes really mess with you. On weekends, I’ve heard that it gets a little backed up, but I never experienced that. However, I’ve also heard that it gets muddy and in REALLY bad shape in the rainy season. At $25, I don’t know what else you’d expect–but then, expectation has a lot to do with it. The club house (and I use that term VERY loosely) is not very nice; more like an open air trailer than anything else. And the driving range is limited to irons only, so it’s difficult to even warm up. For me, the experience was great, but I can’t give it a perfect 10 with those drawbacks. While you discuss the possibility of the muddy course, I had a chance to play it in that condition. This is the addendum. Having had such a great time during our visit, I recommended this course to three of my law school professors (an outing arranged by our mutual friend JC). We all went to play after it had rained 3 or 4 days earlier. One disadvantage to all of those hills is the fact that the course drains very poorly. This is particularly true in areas where your ball is most likely to land. Also, the starter had failed to mention that the very drivable par four 5th hole had been converted into a par 3 because of repairs. There wasn’t even a real green to hit into!! I must admit however, the views were still stellar, the hot dogs were still amazing, the beer still cold, and the par six still the highlight of the entire course. (Missed the eagle putt by inches!) Nice review JK, but I’d give this course a 6.5/10 after seeing it in different conditions.